Today I want to talk about a little of the back-story that lead to me really kicking into high gear on our family’s debt-reduction mission. Check out my story and be sure to leave yours in the comments! I’d love to hear more about what caused you and your family to decide that you really needed to kick some debt booty! If you’ve read my debt story then you know that I haven’t always lived my life with debt. It wasn’t until I started graduate school that I took out my first student loan, then another, and another. Meanwhile, I also financed basic life essentials by paying with credit cards (and never paying them off). In the span of just two short years I amassed over $70,000 in debt. It was an overwhelming amount of debt so I kind of distanced myself from it, psychologically-speaking. I knew I wouldn’t be able to make any real progress on it until I was done with grad school so I just pushed it out of my mind until that time. I graduated with a Ph.D. in August 2013. I was lucky to land a position the same month, but at that point I still wasn’t gung-ho about debt reduction. Really buckling down with debt-reduction had been in the back of my mind for awhile, but I hadn’t felt a great sense of urgency. I was making over minimum payments, but didn’t have a set plan in place (like my debt attack plan of action), and although we had a budget, the spending categories were all set much higher than currently (specifically, a lot more went toward groceries and eating out each month). But the seeds had been sown. By Fall 2013 I was really starting to feel more of a need to get our finances in order. I was working full-time (side note just to clarify the job situation…..I was hired at my old alma mater and worked a full-time/in-person position. But only a few months later in December 2013, the faculty member with whom I worked moved to a new university. I continued to work for the new university through distance, but switched from being a full-time employee to a part-time contract employee. This is the “University B” I’ve referenced many times). I started putting big chunks of my paycheck toward debt. During this time, I started to immerse myself in stories of debt reduction. I’d been reading BAD casually for awhile, but I went back and re-read entire bloggers’ stories. I did the same thing with No More Harvard Debt, Man Versus Debt, and Fun Cheap or Free. Anyway, this was kind of a turning point for me. Hearing Ramsey on Bobby Bones really made me curious about this money guy. I looked up his show and downloaded some (free) podcasts. Hearing the callers’ success stories and debt free screams was so incredibly motivating. I’d already been actively working on debt reduction, but this was the point at which I decided we needed to really be gazelle intense about it (a term Ramsey frequently uses). This all set the stage perfectly for when Adam and Emily decided to step down as bloggers, and new bloggers were selected (in late March 2014 – you can see my first post as an official blogger here). That brings me to the beginning of my journey here. I’ve been lucky. I’d already committed to debt reduction previously, but hearing Ramsey for the first time, and then starting to blog here (and the accountability and encouragement that comes with it) has been a real kick in the pants! I have no doubts that I’d still be on this debt-reduction journey regardless (even if I hadn’t been selected as a blogger here), but I also have no doubt that progress would have been much slower. So I’m very grateful I’ve had your support and encouragement along the way. There’s still a long road ahead, but it actually feels doable now (something I couldn’t say only 2 years ago). 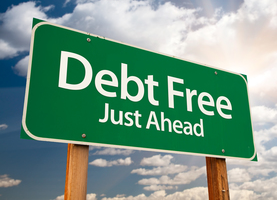 How did you get started on your debt reduction journey? Ours came from just “living in the moment” and burying our heads in the sand. We never wanted to wait for anything and didn’t worry about where the money was coming from. It took my husband being laid off without any warning (and no savings) for us to realize what we had done. We lived off of our retirement but never changed our lifestyle – when hubby got a job it was a HUGE wake-up call – we have very little retirement left and we are in our 50’s – HELLOOOOOO!!! We have since been playing catch up and FINALLY learned our lesson. The biggest regret we have is not teaching our kids good money habits – they both work but spend like they are independently wealthy and have no savings. DON’T do that to your kids – thankfully you learned your lesson much sooner than we did!!! That would definitely be a huge wake-up call! I think debt is so normalized in our culture that it’s so easy to feel like its no-big-deal until something happens that really shakes us and makes us wake up! Thanks for more back story! After getting out of debt, I stay motivated by reading and listening to personal finance blogs and shows. I spent a good chunk of my 20’s drowning in debt – student loans, car loans, credit cards, consolidation loans. I never knew my debt number because it scared the crap out of me. I reached my moment of clarity quite dramatically: I was between jobs, between roommates thus homeless and had no room to charge anymore on my credit cards. I was a bottomless pit of self loathing and humiliation. Things turned around for me quickly when I was able to move in with my aunt and uncle, get a job that allowed me over time, and I started using a check register for the first time in my life. It took me just a bit over a year to get all of my consumer debt paid off. I started paying off my student loans last April and should have them paid in full by April 2016. That’s incredible!!! I’m sure it must have been a scary wake-up call to be jobless, homeless, and no credit but sometimes we have to hit rock bottom to really “get it” financially-speaking. That’s great progress on your student loans! Great job! Seeds are sown, not sewn. Sometimes autocorrect just adds in mistakes! Totally off the subject, but Bobby Bones is a cool guy. 🙂 We just started getting his show on a local station about a year ago. I love Amy, too! Hey Ashley, Great Blog. Being on the “Mission” is a great way to describe the process of getting out of debt. Along the way there are sure to be obstacles, road blocks, and frustrations. But you have to keep the final destination in mind and the rewards that come from reaching it. I actually help people get out of debt. It has become my mission in life since I experienced the ravages of debt first hand. Some one commented that I turned my mess into my message. Anyway, I have written a book on the subject and I have an automated service that does all the heavy lifting for those wanting to get out of debt but are finding the process difficult to stay with. I would live to talk to you further about perhaps an interview or guest blog. Thanks and keep up the good work! I started out this year with $100k in debt. I sold my luxury car and paid off that debt and had money left over so paid down my other debt with the cash I made. I still have a car that I love and can afford. I just received my tax refund too. Now I only owe $40k and it’s only March 1st tomorrow. I am hoping to be totally out of debt by end of August if all goes well. Then I will begin saving. My retirement date is April 30, 2016. I can hardly wait to be debt free and retired. I’ll be living on easy street then…… Life will be stress free and debt free. Good Luck to you all in conquering your debt!! !